Industries change. Businesses adapt. Strategies evolve. And names have to keep up – or they risk reflecting an outdated reality. Consider how new monikers can help gain new business. A few years ago the Savannah (GA) airport became the Savannah/Hilton Head International Airport. Why? Almost half its passengers go to Hilton Head Island in South Carolina, where there’s a much smaller airport. So now, if you search an Internet travel site for “Hilton Head” plus “airport,” the Savannah airport pops up as an option. In the world of Community Hospitals, the word “community” can suggest an inadequate range of services. As these hospitals add physicians, facilities and technology, they often emerge as Regional Hospitals. A similar evolution is taking place in the world of community colleges. More than 40 have dropped the word “community” from their names in the last decade. Moving away from “community” reflects two trends in higher education: The growing number of two-year institutions offering four-year courses; and a broader rebranding effort to shed any perceived stigma of getting a “second-class” education. Market research shows that students associate these streamlined designations with higher quality academics and more resources on campus, and therefore are more likely to apply. 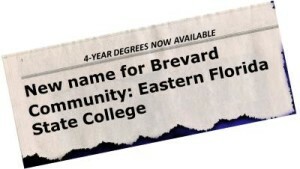 Brevard Community College (Cocoa, FL) became Eastern Florida State College in 2013 to reflect the addition of four-year bachelor degrees. Maui Community College is now known as the University of Hawaii Maui College. Said the University’s board of regents, the change more accurately represents the college’s programs and services that now include 15 associate and two four-year baccalaureate degrees. Henry Ford Community College in Dearborn, MI, 75 years old, with a 23,000-student body, is becoming Henry Ford College. In the real world, your brand name itself never operates in a vacuum. It is surrounded by other language (and other factors) that influence how people interpret your brand. The “back end” of your name and identity may communicate as strongly as the front end. It might be time to reconsider what linguists call the “signifier” in your name. “Community” is one of those words that matters.